Hammond, a prominent anti-Brexiteer, said the tax would rise in line with inflation for long-haul flights. The charge will be frozen for short-haul flights and there is no change in Northern Ireland, where observers noted there had been particularly fierce opposition to the charge. Reports of the fiasco also drew attention to the fact Hammond delivered his bombshell on the same day the transport secretary Chris Grayling emphasised at the AOA annual conference how important airports are to Britain’s future prosperity (see report in this issue). IAG said BA passengers last year paid £682m in APD. “We want to offer more flights to key trading markets, like our European competitors, but APD stifles route development,” it added. The AOA, which had called on Hammond to “seize the opportunity to cut APD by 50%” so UK airports could compete on a level playing field with its European neighbours, also attacked the increase. Only six other EU countries charged a departure tax, it noted, the highest in Germany less than half the UK’s, hampering the UK’s ability to compete for new routes as airlines preferred to fly to countries with low or no aviation taxes. (See also Budget’s e-gates extension in this issue). Supposing that APD is an environmental tax, then why does APD constantly increase whilst airliners get greener and greener. Such a policy is perverse, and amply demonstrates that APD continues as a money-grab by the Chancellor. Setting aside the fact that Hammond is an idiot, as I’ve been saying for the last five years at least, there is no rioting in the streets over APD. In fact, outside of this business, I have never heard anyone even raise the subject. So until the petrol bombs are exploding in Whitehall, the business will have to accept its fate. Tax revenue is like crack cocaine to a government minister. Once they have taken their first dose, it requires ever increasing doses to satisfy the cravings. Unfortunately, with this "drug" no dose is ever fatal to the addict. The Treasury are hooked on APD as though it was a drug. No matter how regressive you tell them it is, they are incapable of seeing reason. 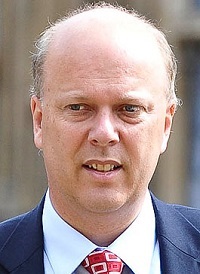 As for Chris Grayling he must rank as one of the most ineffective Transport Ministers I have known.